LONDON--(BUSINESS WIRE)--Technavio market research analysts predict the global nacelle-mounted LIDAR systems market for the wind industry to grow at a CAGR of nearly 6% during the forecast period, 2018-2022, according to their latest report. The need for sustainable energy and the increasing focus on energy security is one of the prominent trends that is being witnessed in the market. The world is highly dependent on fossil fuels, ranging from power generation to generating heat for motive force. However, fossil fuel reserves in the world are limited. Population across the world has been growing significantly. This has resulted in an increase in industrial and economic activities, which has increased the electricity generation. When compared to 1973, the power production has increased by almost four times in 2015, and a majority of the power is generated from fossil fuels, which is harmful to the environment. Unlike the conventional power generation from fossil fuels, generating electricity from wind is highly dependent on meteorological conditions. Wind assessment is carried out to quantify the wind's speed and direction, the temperature, and several other factors, all of which have an impact on the power that is generated from the wind turbine. Technological advances and developments in the blade design are the key factors, which lead to an increase in the wind turbine output and capacity. This market research report segments the global nacelle-mounted LIDAR systems market for the wind industry into the following applications (offshore and onshore) and key regions (the Americas, APAC, and EMEA). It provides an in-depth analysis of the prominent factors influencing the market, including drivers, opportunities, trends, and industry-specific challenges. In 2017, the offshore application segment dominated the market with more than 80% of the market share. The major reason for the dominance of this segment is the heavy investments (because of the high installation costs) made in the development of offshore projects, requiring higher confidence in investing in the project. EMEA held the largest share of the global nacelle-mounted LIDAR systems market for the wind industry in 2017, accounting for a market share of approximately 64%. The market share of this region will decrease by over 7% through the forecast period. However, EMEA will dominate the global market during the period 2018-2022. 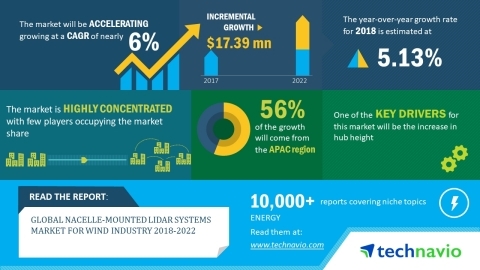 Technavio research analysts predict the global nacelle-mounted LIDAR systems market for wind industry to grow at a CAGR of nearly 6% until 2022.